A secret government unit, a group of renegade paranormal investigators... and a murder no one else can crack. But one assignment calls to them too strongly to resist. 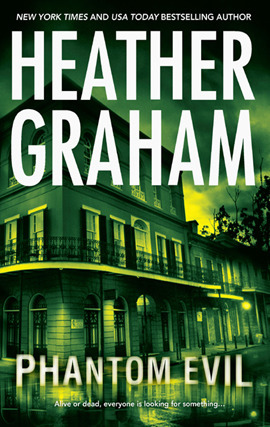 In a historic mansion in New Orleans's French Quarter, a senator's wife falls to her death. Most think she jumped; some say she was pushed. And yet others believe she was beckoned by the ghostly spirits inhabiting the house — once the site of a serial killer's grisly work. In this seemingly unsolvable case, only one thing is certain: whether supernatural or all too human, crimes of passion will cast Jackson and Angela into danger of losing their lives... and their immortal souls. Having had time to mull over the story after finishing it, I'd thought about what it was that worked and didn't work for me; and honestly, while the book is enjoyable and I did like it, it wasn't an amazingly captivating experience. Nonetheless, it gave exactly what it set out to give: an intriguing mystery and crime thriller wrapped around history and ghostly happenings. In fact, the premise of ghosts and history intermingling really is a device that interests me a lot. Not to mention I even wanted to jot down names of the real serial killers mentioned so that I could read up on them. This kind of thing fascinates me to no end. In conclusion, the story is well written and the characters are well-created. For anyone interested in paranormal crime stories such as this, it'll be an enjoyable experience. Although as far as the mystery aspect, it was actually fairly predicable, and some of the dialogue could get kind of preachy. Otherwise, it was a decently good book.